Although pears are available all year round, it’s during late summer and autumn that the home-grown varieties come into their own. 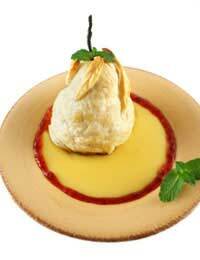 Delicious instead of apple in a ploughman’s lunch, pears have a natural affinity for cheese. Eat as it is with a chunk of mature cheddar, or serve ripe pear sprinkled with crumbled stilton and a little French dressing as a refreshing starter. Or try one of our delicious and simple dessert recipes. Preheat the oven to 200ºC, gas mark 6. Butter a shallow wide baking dish. and halve the pears. Scoop out the core and remove the stalk. Place cut-side down in one layer in the prepared baking dish. Sprinkle with the demerara sugar and put a dot of butter on each pear half. Lightly butter a sheet of greaseproof paper to cover the dish and bake for about 20-30 minutes or until the pears are tender. Serve straight from the oven with cold pouring cream or ice cream. Conference pears are a good variety for baking. Preheat the oven to 150ºC, gas mark 2. Place the wine in a casserole dish (with a tightly-fitting lid) along with the stick of cinnamon, a grating of nutmeg, the zest of the orange, redcurrant jelly and sugar. Bring to the boil and allow to simmer while you prepare the pears. Peel the pears and trim off the base of the core leaving the bottom of the pear flat but the stalks still attached. Add the pears to the simmering liquid, cover with the lid and bake in the oven for 1½ – 2 hours or until the pears are tender. Remove the pears and arrange upright on a serving dish. Bring the liquid back to the boil and reduce to a syrup. Pour over the pears. Serve warm or cold with lots of pouring cream. This can be made up to 2 days in advance, allowed to cool and kept in the fridge. Use plump pears e.g. William pears. Don’t be tempted to use very cheap wine: the better the wine, the better the pudding. Preheat the oven to 180ºC, gas mark 4. Grease and line a 20 cm round tin. Grease the lining paper. Place a little chopped ginger in the indentation in each pear half and arrange, carefully, flat-side down in the tin. Spoon half the ginger syrup over the pears. Sieve the flour, baking powder and ground ginger together into a bowl. Mix in the sugar. Stir in the butter and lightly beaten eggs and mix well to make a smooth batter. Carefully spoon the cake mixture over the pears and level it off. Bake for about 50 minutes or until a skewer inserted in the centre comes out clean. Leave to cool in the tin for 10 minutes and then turn out onto a cooling tray. Remove the lining paper and allow to finish cooling. Sprinkle over any remaining stem ginger pieces and drizzle over the rest of the syrup. Served warm with custard this makes a lovely pudding. You can buy jars of stem ginger in most supermarkets and specialist stores. Wash jars and place in a warm oven to heat while you’re making the chutney. Heat a generous dollop of oil in a saucepan and add the sultanas, raisins and sugar. Fry lightly until the fruits starts to caramelise. Watch it doesn’t burn! Add the vinegar and bring to the boil. Boil for 3 minutes. Add the remaining ingredients, return to the boil and simmer gently until most of the liquid has evaporated. Stir frequently to prevent sticking and burning. When you’re happy with the consistency spoon into the hot jars and seal while still warm. Store in the fridge.